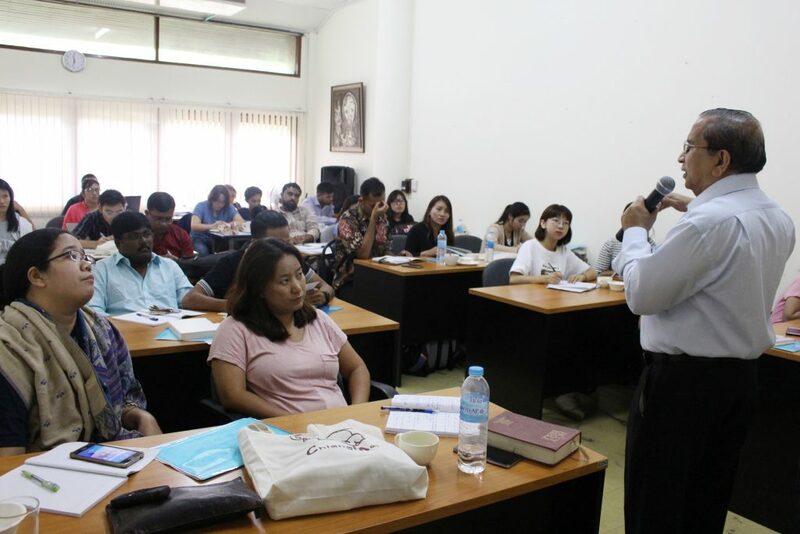 “The ecumenical movement needs renewed interfaith orientations when conflicting theological assumptions and presuppositions are posing challenges to authentic gospel values and Christian witness”, said internationally renowned ecumenical theologian Dr. S. Wesley Ariarajah at the Asian Ecumenical Institute (AEI) of the Christian Conference of Asia (CCA) being held at the Payap University in Chiang Mai, Thailand. Delivering a series of lectures on topics related to the theme of the AEI-2018, ‘Wider Ecumenism in a Pluralistic Asia’ at the month-long ecumenical formation and leadership development training, Ariarajah, an emeritus professor of Drew University in the U.S.A. enthused the prospective ecclesiastical and ecumenical leaders. “Inter-religious dialogue is an attempt to understand people of other faith, not as people opposed to us or competing with us, but as partners within a pilgrimage. It is in the course of the pilgrimage and in the spirit of partnership that we share the message of Christ with co-pilgrims”. “Dialogue challenges us to change and renew. It beckons us to a whole new world of relationships. It urges us to re-examine our theology. It calls us not to give up our faith but to grow in our faith by living it with humility”, he reminded the participants. “Some of the bondages that we have received from the past about Christian faith, the great Commission, and other religious traditions are totally unnecessary for us to be truly Christian, and such perceptions and assumptions are brought to us over the years”, he added. “The entry of deep and divisive religious sentiments into the public space and the rise of religious extremism call on the churches to move beyond traditional forms of dialogue with other religions; the challenge is to enter into a deeper engagement and mutual acceptance of other religious traditions”, explained Ariarajah, a pioneer of the inter-religious dialogue initiatives of the global ecumenical movement and who led the interfaith dialogue programme of the World Council of Churches (WCC) for almost two decades. “Each one of us has to find how we can implement or exercise a new kind of spirituality, a new kind of theology, a new kind of missiology relevant in our time, our culture and context”, Dr. Ariarajah encouraged the students. Dr. Ariarajah emphasised the need to initiate fresh theological creativities to re-discover noble human values and bring communities closer together. The AEI is attended by 25 participants selected from CCA member churches as well as Roman Catholic and Pentecostals churches from different Asian countries and Mauritius, in Africa.